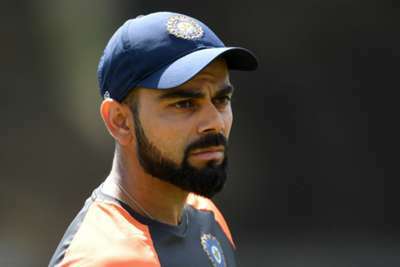 India captain Virat Kohli will leave the "trolling" to others after telling a fan to leave the country because they preferred England and Australia players. A clip of Kohli launching a mobile app earlier this week went viral after he responded to a comment that favourably compared English and Australian batsmen to their Indian counterparts. "OK - I don't think you should live in India," Kohli replied. "Go and live somewhere else. Why are you living in our country and loving other countries? "I don't mind you not liking me, but I don't think you should live in our country and like other things. Get your priorities right." These comments sparked an angry reaction from several fans, with replies on Twitter also gaining attention as they referred to past examples of Kohli praising foreign stars. But the India star took to his social media account on Thursday to suggest he had been speaking in jest and his joke had been misunderstood. "I guess trolling isn't for me, guys - I'll stick to getting trolled," he wrote on Twitter. "I spoke about how 'these Indians' was (sic) mentioned in the comment and that's all. I spoke about how "these Indians" was mentioned in the comment and that's all. I’m all for freedom of choice. Keep it light guys and enjoy the festive season. Love and peace to all. "I'm all for freedom of choice. Keep it light, guys, and enjoy the festive season. Love and peace to all." Kohli is the ICC's top-ranked Test and one-day international batsman. He has 6331 runs in his Test career.